Page compilation errors are a common cause of 'yellow screens of death' (YSOD) encountered by ASP.NET developers. During the heat of development it's very easy to ignore the details of these error messages, and instead resolve them with a bit of intuition. But there are limits to intuition. Today I had to drill into one of these errors and I learnt quite a bit along the way. Are you missing an assembly reference? The type or namespace name 'Helpers' does not exist in the namespace 'System.Web' (are you missing an assembly reference?). To understand what is going on it's useful to have a quick reminder of how ASP.NET works under the hood. Every page or view in an ASP.NET site ultimately gets converted into executable code. By default this happens at runtime. It's a two-step process: Using a Razor view as an example, first the Razor view engine uses code generation to translate the .cshtml file into a .cs file. Then ASP.NET compiles that .cs source into an executable binary. 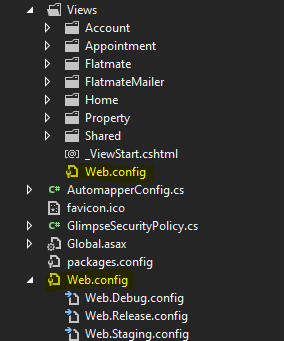 Clicking 'Show Complete Compilation Source' shows me the full C# source file which has been generated by the view engine for the requested page. Here you can clearly see all the using statements generated by the view engine code generator. Clicking on 'Show Detailed Compiler Output' shows you exactly how csc.exe (the C# compiler) was invoked by ASP.NET in order to compile the page's generated C# code. Importantly the /R: parameters are the referenced assemblies. Every C# developer knows that in order to succesfully build an assembly from a module of code you need to make sure all the types you use are made available to the compiler via references. With normal C# projects you add your own references and write your own using statements. But what determines the references and using statements when code is generated for pages and compiled by ASP.NET? The references used by ASP.NET during page compilation are specified entirely in configuration files using the assemblies element for compilation. "But I haven't specified an assemblies element! ", I hear you say. Optionally, you can specify the asterisk (*) wildcard character to add every assembly within the private assembly cache for the application, which is located either in the \bin subdirectory of an application or in the.NET Framework installation directory (%systemroot%\Microsoft.NET\Framework\version). The implications of this are that you can easily ensure additional assemblies get referenced during page compilation by placing them in your private assembly cache. And you do that simply by changing the "Copy Local" property of an assembly to true (correlated with the Private reference attribute within an MSBUILD file). But what if you don't want to add the assembly to your private assembly cache? In that case you just explicity add it to your application-level web.config using the same assemblies.add element shown above. If you are using Razor the default namespaces are hardcoded! You can easily add to the list of default namespaces by adding a razor-specific namespaces element to your web.config (sample shown below), but you cannot easily remove default namespaces. Even attempting to use <clear/> does not work. If you really need to get rid of default namespaces you will have to do it in code. Bare in mind that projects often have a web.config specifically for the Views folder (e.g. MVC) and the page compiler will pay attention to the config heirarchy. Typically you will want to makes changes specific to your Views web.config. Using the information in this blog post you should be able to understand and resolve any page compilation errors relating to missing references and/or incorrect using statements. Good luck!